Surveys are the bedrock of data-driven research. The quality and reliability of your data and, by extension, your entire project hinges on the effectiveness of your survey. Get it wrong and you’ll be left wading through the murky marshes of meaningless data that make little or no sense, with an immense investment of time and effort wasted. Going ahead with an undercooked survey also reflects poorly on your organization. The people who have been through your earlier survey will be less than accommodating when you reach out to them next time even if you return with a new and improved version. 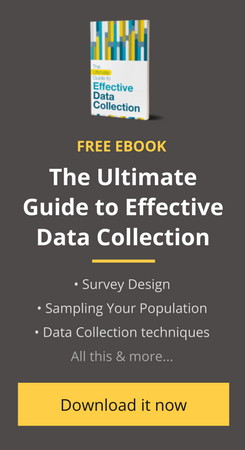 Get useful tips on Survey Design, Sampling your Population and 8 other important ways to boost your Data Collection. It is important then to get your survey right the first time, and doing that requires a concerted and conscious focus on thought and planning. Don’t let this be a daunting proposition though; think of it as an opportunity. Good data means good results, and if your survey has been designed well, half your work is done right there. It’s easy, really. Let’s walk through the eight steps to designing an ideal survey. For ease of understanding, we’ll consider these steps with respect to an impact assessment for a self-help group. Defining the purpose of your survey in clear, unambiguous terms is absolutely vital. It sets the direction for everything you do. Coming back to the drawing board and reminding yourself of the purpose of the survey can be a good way to get back on track when the team feels like it’s stuck in a rut and is unable to draw inspiration to continue driving forward. The goals of the survey also dictate all the other aspects of survey design to a large extent. An example of a clear, constructive goal could be “assess the impact of microfinance on people living in a certain district”. As we move through the rest of the steps, we’ll see how this goal lends itself to every aspect of the survey. In order to collect data that is relevant to the purpose of your study, it is important that you reach out to the right people. Identifying the right sample for your survey is another critical aspect of survey and bears heavily on the structure and mode of survey that you choose to employ. The nature and language of the questions used while formulating the questionnaire also depend heavily on the target population. Selection of the target population follows largely from the goal that you have selected for your survey. The target in the case of the example we’ve taken here would be the working population of the district between 18 and 60 years of age. Dividing a questionnaire into categories results in an intuitive structure that is easy for participants to navigate. The researcher can also improve the survey experience further by providing additional explanation at the beginning of each section. This gives the respondent an idea of what to expect. Categorizing the questions while designing the survey, even before you get down to writing the questions, helps maintain the focus on the different research objectives and ensures a balanced output. Dividing the questionnaire, for instance, into sections on Particulars (personal background information) and Impact Assessment (Social, Educational and Cultural) will lend a logical flow to the survey that makes it easier to grasp. This will also make it easier for you to assign categories to the data that you collect and simplify the analysis process. The mode that you employ to administer the survey depends on the sample type and size. Use the mediums that are the most effective in reaching your target population. The time span of the research is also an important factor that impacts this decision. Leveraging technology to maximize the extent and depth of your reach might come in very handy in such situations. Selecting the wrong mode for your survey can cripple your research. Launching a web-based survey that needs people to visit a website in order to answer the questionnaire, for instance, will be nearly useless while trying to reach people in villages that have limited or no internet access. The mode of the survey should use tools and infrastructure that can easily reach your target population and account for the comfort level that your respondents have towards the technology that you employ. Using the right tool for the right job is essential in any endeavor. Questions are the tools of your survey and picking the wrong question type can be as awkward as using a screwdriver to knit a pullover. Throw in a good mix of close ended questions – dichotomous (yes/no), multiple choice, and ordinal scale (rank, preference) – after considering the purpose that each question type will serve. Top it up with open ended questions where necessary. Read more about how to optimize your survey quality by choosing the right question types. Words mean different things to different people and taking care of some of the finer nuances involved in formulating an effective question can go a long way. Don’t leave any scope for ambiguity. Be clear about what you need and get your questions proofread by somebody who is not familiar with your study before sending out the survey. Brevity is essential; respondents are more likely to respond positively to questions that are concise and able to hold their attention. Avoid unnecessary jargon; the language should be as simple and generic as possible. And finally, the answer choices must be well defined. If you ask respondents to rank their level of satisfaction on a scale from 1 to 5 but fail to explain whether 1 is very satisfied or 5 is very satisfied, their responses will be of little value. Introduction is often considered to be the most critical part of the survey as a majority of the respondents make up their mind about whether or not they would like to answer the survey after going through the introduction. The introduction, thus, needs to make a good, strong first impression. It sets the tone for the rest of the survey and lays down the context in a simple, easy to comprehend manner. Begin with a statement thanking the respondents for their time and explain the subject of the study along with a confidentiality statement to address privacy concerns. Mention the expected time required to complete the survey and display the percentage completed as the respondent moves ahead. Once the survey is ready, execute your plans through a robust collection mechanism. If the survey is being conducted in person, make sure the people who administer the survey completely understand the purpose of the survey and are comfortable conversing with the population they’re supposed to interact with. Training them on the use of open-ended and unstructured questions and briefing them about the technicalities of the survey is imperative. Before you head out to launch your survey in the field or online, test the survey over a small control group to see if everything functions the way you expect it to. Eight simple steps and you’re all set to go. If you have designed your survey well and executed your plans to perfection, good, clean data filled with tremendous potential for gathering insights will start surging in. To know more about how you can analyze this data and make the most of your survey, read about the fascinating world of data science. Looking for a mobile-friendly data collection app? Check out Collect, our Android-based data collection tool! It has been used by Google, Tata Trusts, the Azim Premji Philanthropic Initiatives and others to collect over 20 million survey responses. Very educational! I just browsed on the article so can I have this printed? I am involved in organizing a Basic Ecclesial Community in our Parish. From what I learned from this article making a survey within our Parish community is essential. So thankful to God He led me to your site! A good stuff. Thanks a lot! This is a great resource for people to think about their survey development. In addition to your 8 steps, I might add one more intermediate step. I have found it very useful to set up my data analysis plan before I finalize my survey. What data will I end up with? How will I analyze the data to find the results I hope to find? I have even created dummy data for those close-ended questions and created the tables and figures (and even did my “t-test” on the dummy data) that will be created from the final instrument. This gives me the chance to question every item to make sure it is NECESSARY to tell the story or to answer the question I am posing. You mention brevity as an important concept and I would say that a way to ensure brevity is to make sure every item is important by interrogating its value to the study. Glad you liked the article Michael, and thanks for pointing out this crucial aspect. Factoring in the method and tools for data analysis are indeed a crucial aspect of survey design. However, we think it would be fair to say that this is implicit to step 5 (choose the right question type) and step 6 (formulate the questions). Would love to hear your thoughts! This step actually is a very important step. It gives the researcher the possibility to make sure that his data collection tool can be able to measure the effect he wants to measure. This is very insightful. Thanks.